Now that you know what forex is, why you should trade it, and who makes up the forex market, it’s about time you learned when you can trade. It’s time to learn about the different forex trading sessions. Yes, it is true that the forex market is open 24 hours a day, but that doesn’t mean it’s always active the entire day. You can make money trading when the market moves up, and you can even make money when the market moves down. BUT you will have a very difficult time trying to make money when the market doesn’t move at all. And believe us, there will be times when the market is as still as the victims of Medusa. This lesson will help determine when the best times of the day are to trade. 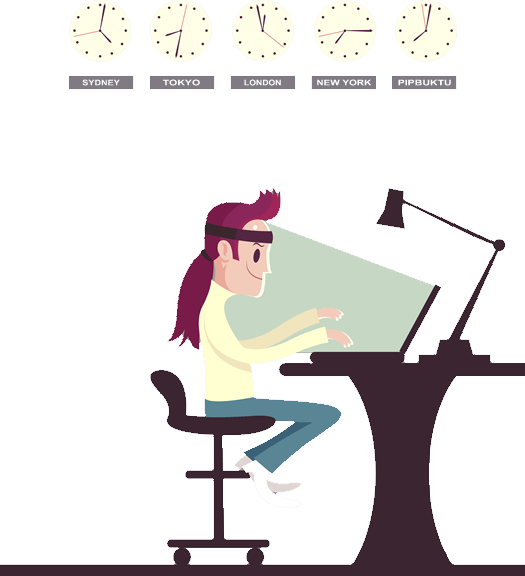 Before looking at the best times to trade, we must look at what a 24-hour day in the forex world looks like. Actual open and close times are based on local business hours, with most business hours starting somewhere between 7-9 AM local time. Open and close times will also vary during the months of October/November and March/April as some countries (like the United States, England and Australia) shift to/from daylight savings time (DST). The day of the month that a country shifts to/from DST also varies, confusing us even more. And Japan doesn’t observe daylight savings, so thank you Japan for keeping it simple. Now, you’re probably looking at the Sydney Open and wondering why it shifts two hours in the Eastern Timezone. You’d think that Sydney’s Open would only move one hour when the U.S. adjusts for standard time, but remember that when the U.S. shifts one hour back, Sydney actually moves forward by one hour (seasons are opposite in Australia). You should always remember this if you ever plan to trade during that time period. Also take notice that in between each forex trading session, there is a period of time where two sessions are open at the same time. 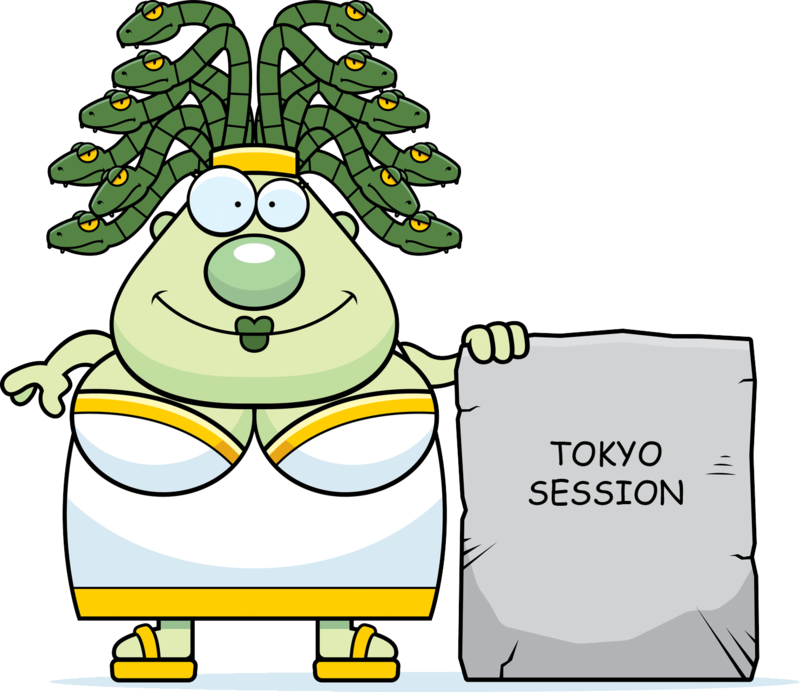 During the summer, from 3:00-4:00 AM ET, for example, the Tokyo session and London session overlap, and during both summer and winter from 8:00 AM-12:00 PM ET, the London session and the New York session session overlap. Naturally, these are the busiest times during the trading day because there is more volume when two markets are open at the same time. This makes sense because, during those times, all the market participants are wheelin’ and dealin’, which means that more money is transferring hands. 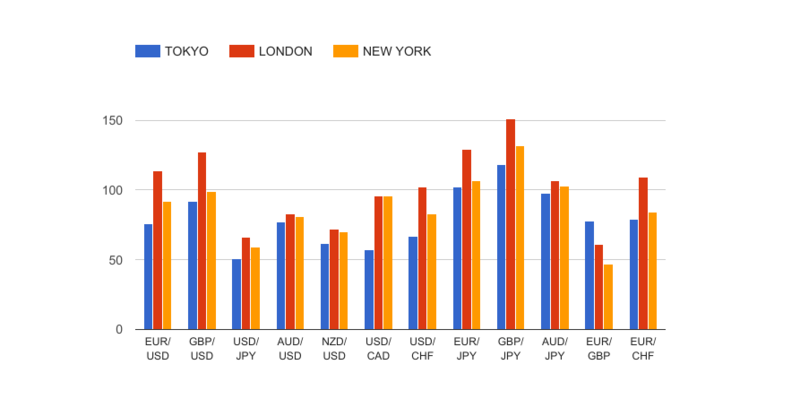 Now let’s take a look at the average pip movement of the major currency pairs during each forex trading session. From the table, you will see that the London session normally provides the most movement. Notice how some currency pairs have much larger pip movements than others. Let’s take a more in-depth look at each of the sessions, as well as those periods when the sessions overlap.